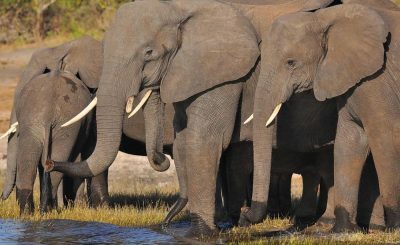 British trophy hunters brought home two tonnes of elephant tusks from Africa over the past decade, new figures show. Nearly 400 ‘trophies’ from the world’s most endangered animals have been brought into Britain by hunters in recent years. A motion calling for an urgent ban on trophy imports has now won the support of MPs from the Conservatives, Labour, Lib Dem, SNP, Plaid Cymru, Green Party, and Democratic Unionist Party. The Campaign to Ban Trophy Hunting said UN figures showed that the most popular trophies for UK hunters included elephants, lions, leopards and rhinoceroses – all of which are included in Appendix I of CITES, the Convention on the International Trade in Endangered Species. Appendix I animals are considered to be at greatest risk of extinction. Other Appendix I animals killed by British trophy hunters include cheetahs, Nile crocodiles, zebras and caracals. Jeremy Corbyn, the Labour leader, criticised the loophole in CITES which currently allows trophy hunters to kill the world’s most endangered animals. “I’m totally opposed to trophy hunting and to the importing of animals that have been killed for trophy hunting. CITES needs to include trophy hunting because we have to protect animals that are facing extinction,“ he said. Bill Oddie, the Conservationist and broadcaster, said trophy hunting was putting increasing pressure on vulnerable wildlife. “When you’ve got a scattered, dwindling population, the loss of a handful of animals doesn’t just cause a ripple effect – it can be like a tsunami wave. “Trophy hunting has always been senseless cruelty. Letting people kill them because they think it’s entertaining is just insane, especially when you’re talking about wildlife with such a vulnerable status”. Zac Goldsmith is one of a number of leading Conservatives calling for a ban, and has now tabled a motion in Parliament which has won cross-party support. Sir Ed Davey MP, the former Lib Dem minister, called for new laws to be introduced. He said claims by trophy hunters that the ‘sport’ helped fund wildlife conservation and poverty eradication programmes were deliberately misleading. “Trophy hunting should be banned across the world, and that ban should be enforced very strongly,” he argued. Caroline Lucas, the Green Party MP, said the government had failed to follow through on a 2015 promise to ban lion trophy imports. “Our government is supposed to be doing something about this. They pledged to make a start by banning the imports of lion trophies. Eduardo Gonçalves, from the Campaign to Ban Trophy Hunting, said the public would be shocked to learn both that British trophy hunters were deliberately killing endangered animals and bringing in elephant tusks, and that the law allowed them to do it. “Over the last decade, UK hunters have brought home over 2500 trophies, of which nearly 400 were from some of the most endangered species on the planet. “UK hunters have killed literally hundreds of elephants, hippos, leopards, zebras and lions – and then brought home their trophies and body parts for show. Gonçalves accused the trophy hunting industry of deliberately encouraging the large-scale killing of rare wildlife. “The Safari Club International ‘Global Hunting Award’ challenges hunters to kill a minimum of 12 species in Africa. Their ‘Cats of the World’ prize is handed to those who kill a lion, leopard, cheetah, jaguar, cougar and several other big cats. “Its other awards include the infamous ‘Africa 29’ which is given to hunters who kill no fewer than 29 different wildlife species. This is grotesque, uncontrolled slaughter on a massive scale, and it’s pushing threatened species to the brink of extinction”. He added that the loopholes in wildlife protection laws were being exploited by poachers posing as trophy hunters. “Many people think the hunting of endangered wildlife is banned. In fact trophy hunters are exempted from CITES. It’s an extraordinary loophole that poachers are taking advantage of. Around 300 rhino horns are known to have been exported by phony trophy hunters between 2009-2014 alone. Brendan Montague is editor of The Ecologist. This article is based on a press release from the Campaign to Ban Trophy Hunting.